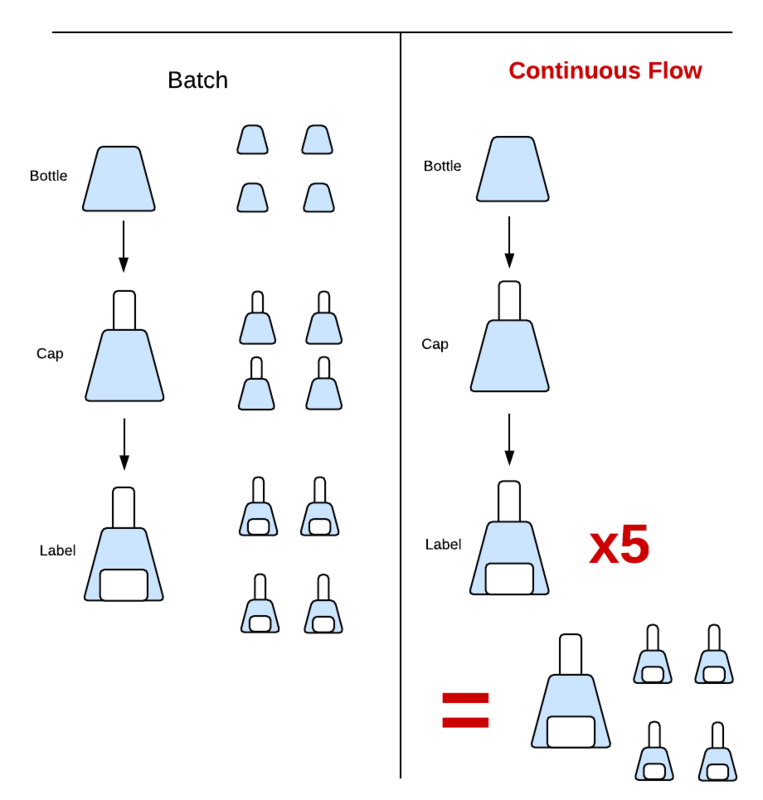 Read this page to learn the difference between a continuous flow process and batch manufacturing. Scroll down for a diagram of both types of processes provided by Lucidchart. You can easily create your own diagrams with Lucidchart’s intuitive technology. Map out manufacturing plans, illustrate key business concepts, and more. A continuous flow process is a method of manufacturing that aims to move a single unit in each step of a process, rather than treating units as batches for each step. The diagram below helps illustrate how this works. In the left column, you can see a standard batch process. Each step is completed for several units at once, which comprises a batch. In the right column we see a single unit go through the flow, and the process is repeated as many times as necessary. This may seem to take longer, but it can actually be much more time efficient, as long as the next unit is introduced to the process as soon as the first unit has completed step one. The process is called “continuous flow” because you are continuously producing new products. It’s advantageous in many industries, such as vehicle manufacturing, where you need to keep up with high demand from consumers. Batch production is useful in other scenarios as well, such as completing one-time work for a client. Continuous flow is one aspect of lean manufacturing, which is a method used to improve production efficiency. You can find free templates and make lean manufacturing diagrams with Lucidchart. Whether you need to perform root cause analysis or design a Hoshin Kanri matrix, we can help. Sign up for Lucidchart to learn more about diagramming for business. You’ll be sure to improve your production process!